As readers of this blog already know, I am a huge Sharon Shinn fan. Archangel is one of my very favorite comfort reads and so is Mystic and Rider--the first in Shinn's Twelve Houses series. Her characters become friends so quickly I forget what life was like before I read them. That's why the Twelve Houses series is so much fun. It follows a disparate group of six travelers who, despite differences of rank, temperament, and fundamental beliefs, become first allies and later friends. Shinn tracks this six of them through four books, eventually wrapping up each thread of the overarching story. Or so we thought. Fortune and Fate is a companion novel to the Twelve Houses series. An unexpected and delightfully welcome fifth volume. Wen was a King's Rider, one of fifty elite guards dedicated to protecting the king with their lives if necessary. Until the king died. On her watch. Shortly after, Wen resigned her post and rode out of the capital city forever. Two years later she is still roaming the countryside, searching for people to save in a futile attempt to atone for her sins. For failing to save her liege. 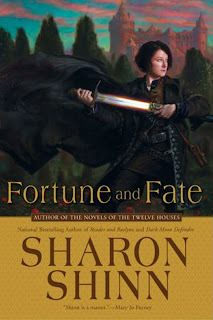 Determined not to connect with anyone ever again, Wen finds herself reluctantly accepting a post as captain of the guard at House Fortunalt after saving the young serramarra's life. Answering to the serramarra's guardian, the bookish Jasper Palladar, Wen promises to stay for a month at most. Long enough to train a rough guard. Not long enough to form any attachments or find any reasons to stay. Meanwhile, the queen's consort wends his way through the southern Houses on a journey to sound out the new Thirteenth House nobles as well as the upcoming generation of marlords and marladies. The story alternates chapters between Wen's sojourn at Fortune and Cammon's journey through Gisseltess, Rappengrass, and Fortunalt. But this is essentially Wen's own story. And I was pleased to find myself soon attached to this tough young woman so intently bent on self destruction. It was naturally extremely pleasant to spend time with Cammon, Senneth, and Justin again as well. But Ms. Shinn does a good job of extending her readers' affections to Wen and her particular set of troubles. The secondary characters are well-drawn and sympathetic, especially Jasper, Karryn, and Ryne--the young lordling from Coravann. This is a quieter, more self-contained novel than the previous Twelve Houses books. It unfolds slowly as Wen struggles to retire her ghosts and maintain some distance from those who would try to keep her. As Jasper quietly works to rebuild a house in disgrace and extend Wen's stay at Fortune. As Karryn learns who she can trust and how to differentiate herself from her parents' failures. A very fine coda to a simply wonderful series. I love love love the Samaria series, but never really got into The Twelve Houses. Ooh, which one is your favorite of the Samaria books? But if I had to... Angel-Seeker and Angelica, probably. :) But they're all very good. They really are. I love passing those ones on.